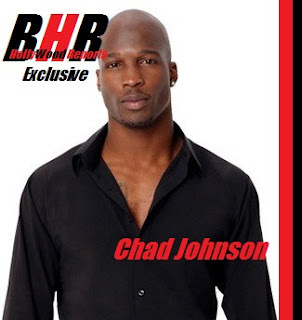 BHRHollyWood Reports...The judge in the Chad Johnson case might well have gone too far, but you know what? She went too far in the right direction by sentencing him to 30 days in jail after he tried to turn her courtroom -- a place where justice is dispensed on behalf of domestic violence victims -- into a locker room. The former N.F.L. star Chad Johnson, known as Chad Ochocinco during his playing days, was sentenced for a probation violation in a domestic violence case. Judge Kathleen McHugh of Broward County Circuit Court in Florida angrily rejected a no-jail plea deal after Johnson playfully slapped his lawyer on the backside in court. Johnson, known as Chad Ochocinco for his jersey number in Spanish during his playing days, had reached a deal with prosecutors calling for community service and counseling instead of jail. Broward County Circuit Judge Kathleen McHugh said she would tack on an additional three months' probation because Johnson had failed to meet with his probation officer during three previous months. It was all set until Johnson, when asked by McHugh if he was satisfied with his lawyer Adam Swickle, gave the attorney a light swat on the rear -- as football players routinely do to each other on the field. The courtroom erupted in laughter and at that McHugh said she wouldn't accept the deal.